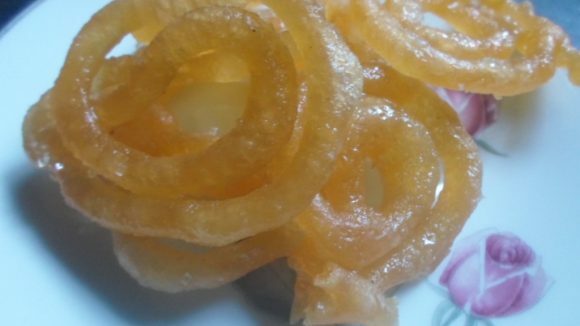 This is a simple to understand step-by-step Recipe for preparing at home the Mughlai specialty Sweet Dish from Hyderabad Zarda. This sweet rice, which is an authentic and traditional Hyderabadi rice preparation can be served as a main course rice dish or even served as a Dessert. First wash the Rice and keep aside for 30 minutes. Soak the Almonds and peal the skin and then cut in small pieces. Soak the Saffron in a table spoon filled with Milk. Deep fry the Almonds and Kismis. Heat the Ghee and then add the Laung, Dalchini, and Green Cardamoms then add the Rice and fry till color change in to Pink. Then add 4 cups of hot water and cook the Rice. Then add the Sugar and cook for 5- 7 minutes on slow sim and cover with a lid. Then add the Pista, Almonds, Kismis, Saffron, and Lemon and mix well. While serving decorate with Pineapple and Orange pieces.